One of the worst critiques of Russell Wesbrook’s MVP candidacy is the one that tries to sneer at the very concept of the triple-double. “It’s an arbitrary accomplishment!” mewls the weenie. “We’re biased towards round numbers!” he continues, sniveling, pretending like a the roundness of 31-10-10 somehow renders its existence unimpressive. But, fine, for the sake of argument, let’s say that we’ve all been misled by the fact that two 10s look pretty when lined up next to each other. The game Westbrook played against the Grizzlies last night presents a good case study, then. Westbrook finished with 45 points, 10 assists, and nine rebounds in a 103-100 victory. Are you feeling unimpressed? Has that lonely “9" in the rebounds column revealed the great lie to you, or are you someone who knows how to tie their own shoes? 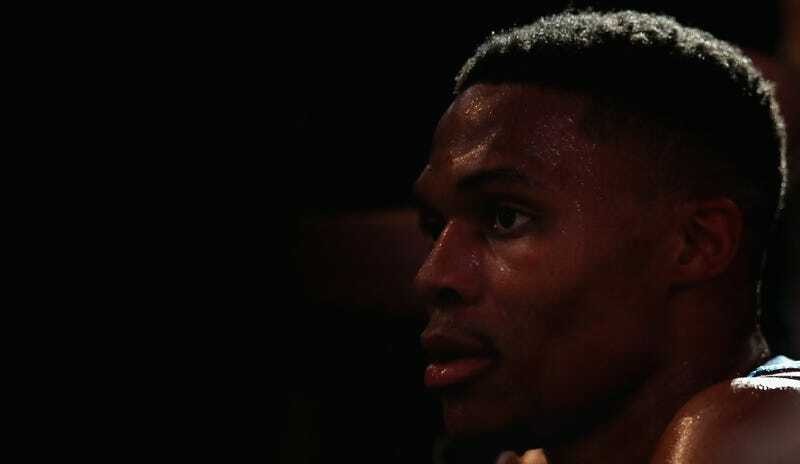 Westbrook won his team another game last night. With just under five minutes left to play, the score was tied 89-89, and that’s when Russ went to work. In the final four minutes of the game, he scored 11 points on 3-of-4 shooting, grabbed three rebounds, hit two deep threes, and set up another Doug McDermott triple that helped secure the win. Westbrook needs just six assists on Friday night against the Suns to become the first player since Oscar Robertson to average a triple-double for an entire season. He’s also going to win the scoring title. He’s also the best clutch player in the league. He’s the goddamn MVP.